specific charge [charge to mass ratio (e/m)] of the cathode rays. The photons are the quanta/packets of light, which are emitted by a source of radiation. 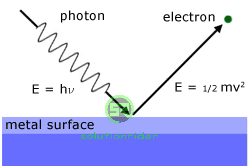 (i) The energy of a photon is given as, E = hv, where v is the frequency of light. (iii) The rest mass of a photon is zero. 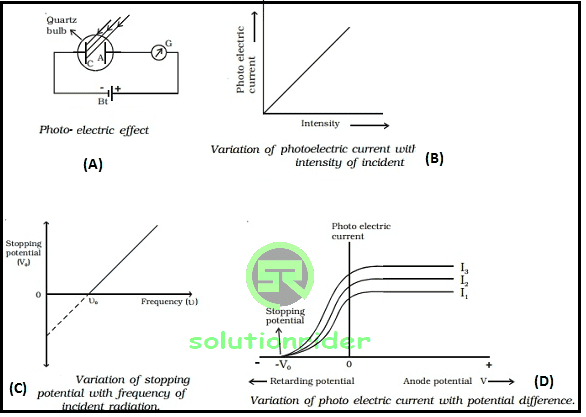 then the emission of electrons is called Photo-electric effect. (i) Work function: The minimum energy that is required to eject an electron from the metal is called Work-function of metal. It is denoted as φ. (ii) Threshold wavelength: The maximum of light that can eject an electron from the metal is called Threshold wavelength of metal. It is denoted as λMAX. (iii) Threshold frequency: The minimum frequency of light that can eject an electron from the metal surface is called Threshold frequency of metal. It is denoted as v0. v is frequency of incident light. current is is directly proportional to the intensity of incident light. 2) Below threshold frequency, emission of photo electrons cannot take place. photo-electrons depends upon the frequency of incident light.